"A warm, witty response to dark times." Shout! Studios has debuted an official trailer for an indie comedy titled Humor Me, from first-time director Sam Hoffman. The film stars Jemaine Clement as a struggling New York playwright who is forced to move in with his eccentric dad in a New Jersey retirement community after his wife decides to leave him. Elliot Gould stars as his father, and the two find awkward ways to bond in this predicament while figuring out how best to enjoy life. The cast includes Ingrid Michaelson, Annie Potts, Bebe Neuwirth, Priscilla Lopez, Erich Bergen, and Maria Dizzia. I haven't heard of this film before, but I'm always down for anything with Jemaine Clement in it, and this looks like it will be enjoyable. Humor Me is a heartfelt father-son light comedy about a struggling playwright (Jemaine Clement) who is forced to move in with his joke-telling dad (Elliot Gould) in a New Jersey retirement community and learns, as his father often says, "life's going to happen, whether you smile or not." Humor Me is written and directed by newcomer American filmmaker Sam Hoffman, an executive producer now making his feature directorial debut with this film. This first premiered at the Denver Film Festival earlier this fall, but hasn't played at many other festivals. Shout! 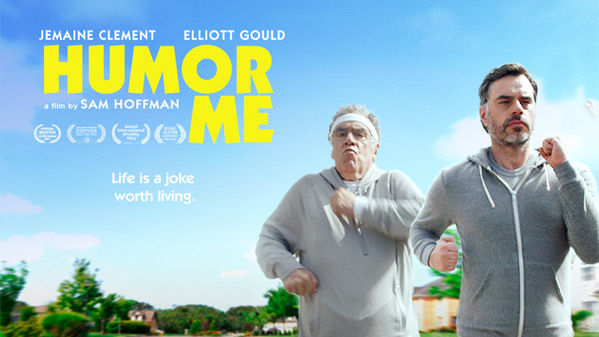 Studios will release Hoffman's Humor Me in select theaters + on VOD starting January 12th, 2018 at the beginning of next year. Anyone interested in seeing this film?